We welcome the release of the Standards for Paediatric Emergency Care - Expert Consensus Report for the Western Cape which outlines the recommended standards for the care of children in Emergency Centres (EC’s) and Emergency Medical Services (EMS) in the Western Cape. The standards have adopted a child rights approach in order to enhance child- and family-friendly care in emergency settings, and cover a range of topics including triage, assessment, referral, transfer, transport, staffing, training and patient safety. The right to emergency care is enshrined in article 27(3) of the South African Constitution. However, this has little meaning if the quality of emergency care itself is poor. Setting standards in health care is an important means of achieving quality services. This is especially true of the emergency environment, where the work is unpredictable, fast-paced and demanding, yet often determines significant outcomes. Emergency services need to be tailored to the special requirements of child patients and their families. This is necessary due to children's size, immaturity, dependency and their many differences to adults in terms of emergency pathologies. 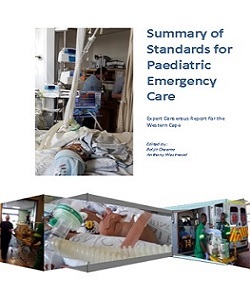 Existing policy and standards documents for health care, such as the Essential Medicines List (EMLs), National Core Standards and the Western Cape’s 2009 Package of Care for Acute Hospitals, give limited guidance on emergency care standards for children. Likewise, there is little guidance on critical issues such as staffing, training and equipment specifically in relationship to paediatric emergency patients. Recognising the effects that these gaps have on the quality of emergency care available to ill and injured children in the Western Cape, the Provincial Clinical Governance Committees for both Child Health and Emergency Medicine established a joint Technical Work Group to develop a set of standards for emergency care in public health services in the province. This report is the result of that process. It comprehensively addresses many aspects of emergency care provision for children, and is recognised by the Western Cape DoH as a valuable consensus report by an expert group of clinicians. It provides standards against which service providers can measure their services, and a direction in which to move to improve emergency care for children. A number of members of the School of Child and Adolescent Health contributed to chapters in this document, and the team was led by Dr Baljit Cheema.